In French, to give opinions or state facts about things, it is can be expressed in two ways: either c'est or il est/elle est. It can be tricky to know when to use one or the other, so here's the way to do it! It is a pretty dress. Qu'est-ce que tu en penses ? - C'est un livre intéressant. What do you think about it? - It's an interesting book. C'est le fils de Martha. Qui est Sylvie ? - C'est ma sœur. Who's Sylvie? - She's my sister. C'est la robe que je porte au travail. That's the dress that I wear at work. If it/he/she is is followed by un/une/le/la... (any form of article / determinant) - it is a beautiful dress / she is a nice person - then you will use c'est. Tu étudies la science ? - Oui, c'est passionnant ! Do you study science? - Yes, it's thrilling! In those cases, we're expressing opinions or statements that refer to the thing generally: we're saying science in general is thrilling, or that something unspecified is great or delicious. Therefore, here we use c'est to say it is. Tu aimes mon pull ? -Oui, il est très beau. Do you like my sweater? -Yes, it's very nice. Où est ta tasse ? - Elle est sur la table. Where is your cup? -It is on the table. Et le lit? - Il est encore dans le camion. What about the bed? - It's still in the truck. In those cases, the opinions expressed relate to specific items, we know precisely what we're talking about, whether it be my jumper (not jumpers in general), your plate or that specific bed. Therefore, here we use il est or elle est, depending on the gender of the thing it refers to (remember that things have genders too in French!). When using il/elle, you have to make adjectives agree accordingly, whereas you always use the masculine with c'est. Tu aimes la soupe? - Oui, elle est délicieuse! Do you like the soup? - Yes, it's delicious! Tu aimes la soupe? - Oui, c'est réconfortant! Do you like soup? -Yes, it's comforting! Do you like the soup? is asking about a specific soup, i.e. the one they're eating at that moment. The tricky fact is that in French, you use the definite article le, la, l' for general statements as well as specific the. 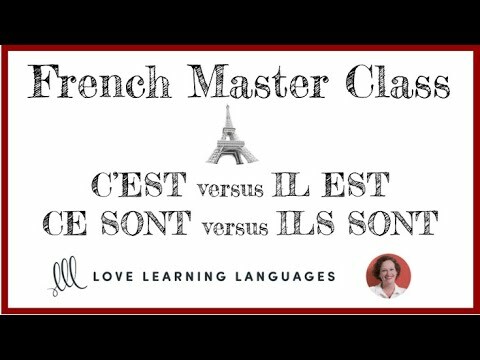 See Using le, la, l', les before nouns when generalising (definite articles). So here you need to know the context to use either c'est (soup in general) or il est/elle est (the specific soup). One mustn't talk back to one's parents. On ne doit pas répondre à ses parents. Your answer is " On " that is what I don't understand to me the question does not say We mustn't talk back to one's parents. so the answer should be "Un" if not why ? On can be both: "we" (mostly used in familiar contexts) and "one" (impersonal we). "Un" doesn't work in French. You can't translate the English "one" literally. On can mean one in the sense that you're using it; it can also mean the rather informal we (in place of nous), as well they or you used in general, and not referring to specific people or groups. Is this a good summary? Been looking at this for a long time. Conclusion is if you want to write a sentence using a/the/my , Or making a general opinion then use c'est. Otherwise use I'll/Elle est to make a specific opinion towards something/someone if there is no a/the/my in the sentence? This is pretty accurate but I prefer working with their French equivalents. There are others and you can add, Monsieur, Madame and names to the list. Elle est une bonne nageuse ! Has anybody seen the subtítles in the video ? Tu aimes le violet ? Oui, ________ est très joli! I answered with 'il', because it fits the criteria that we are not talking about something general, but something specifically referred to previously: the color violet. The answer was actually "c'". I guess if the context were about a specific violet, like the third one from the left in a bunch of them, then you would il. The question, as I understand it, is asking about violets in general. Sometimes in French you use the singular in this case, where in English you would use plural. Thanks for your reply. I thought violet in this context meant "purple". Or does it, in fact, refer to the flower ? You are probably right. Could refer to the color, too. In that case it is the same kind of reasoning. The general color asks for ce instead of il. One option given as an answer is "Each is all red". Is this where we would use "on"? On est tout rouge. Can I say Il est le fils de Martha instead of C'est le fils de Martha? I've only ever heard C'est le fils de Martha. But isn't that very example given in the lesson? Why do we say "Qu'est-ce que tu en penses ? instead of "Qu'est-ce que tu penses ?" Qu'est-ce que tu en penses? -- What do you think of it? What do you mean by "why do we say this"? Qu'est-ce que tu penses? -- What do you think? It depends on what you want to say. I am surprised at this. As a native English speaker I would say that "What do you think?" means the same as "What to you think of/about it?" You can drop the "of/about it" when the context is obvious. I'm obviously not a native French speaker, but I would have thought you can't do the same thing in French, so "Qu'est-ce que tu penses?" is either wrong, or implies a direct object, so it would have to mean something like "What are you planning?". But is that how you would say it in French? Wouldn't it be "À quoi tu penses?" Qu'est-ce que tu pense. -- What are you thinking about? À quoi tu penses. -- What are you thinking about? According to her, they are both possible and mean exactly the same thing: asking someone what he is thinking, without reference to anything mentioned earlier.